Getting your kids to play outside is a goal of many parents over the summer. Swimming is a great way for kids to exercise and have fun, with the only hiccup being having to get them away from their technology and into the water. If you want to get your child into the pool more often, here are some surefire tips to help make that happen. You don’t need to throw a big pool party each week. Just pick a day where you have dinner or lunch by the pool or play games in the pool. You can even let your child invite a few friends on occasion to change things up. By making the pool a place of fun, your child will become more naturally drawn to it. Kids love places associated with good memories, so set that stage in and around your pool. Swimming lessons in Queen Creek will help your child become more confident in the water and learn new techniques. It’s also a serious matter of safety. The Centers for Disease Control and Prevention reports that around one in five fatal drowning victims are children under the age of 14, and for every one fatal victim, there are five more children who go to the emergency room because of water-submersion incidents (http://www.cdc.gov/homeandrecreationalsafety/water-safety/waterinjuries-factsheet.html). 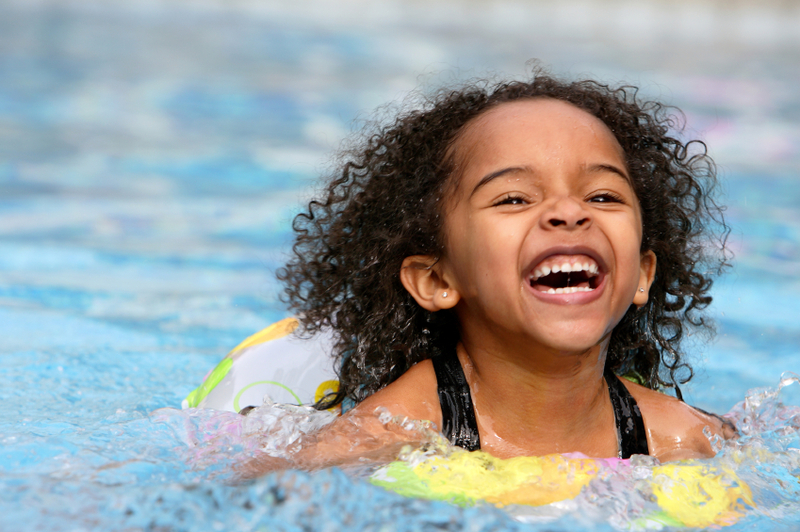 During swimming lessons, your child will learn safety swimming techniques, how to behave around water, and other lifesaving skills and pieces of information. Inexpensive pool floats and toys can make any pool more appealing to kids. Just make sure the items you buy are actually safe for the water and appropriate for your child’s age. The US Consumer Product Safety Commission does regulate some pool toys, and you can find information on their official website (http://www.cpsc.gov/en/Business–Manufacturing/Business-Education/Toy-Safety/). Don’t use toys that are not meant for water in the pool. Games are another avenue you can try, and you don’t need expensive equipment for many popular standbys. There’s freeze tag, which is played just like regular freeze tag but in water, in addition to Marco Polo and the chase “sharks and minnows” game. If you’re not sure what to pick, ask your kids for suggestions or have them create a simple game for all of you to play. Have friends, family members or even trusted neighbors with kids close to your child’s age come over occasionally. That way, you get to spend some adult social time while the kids enjoy time in the pool under your watchful eye. This turns the pool into even more of a fun zone, and it’s social interaction outside of school for your kids, too. No matter how you decide to encourage your kids to get some more swimming in, remember to always keep it light and fun. If you’re too serious, your kids may view the pool as more of an obligation than a place to enjoy!